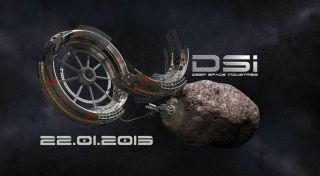 The new company Deep Space Industries Inc. plans to tap the many resources asteroids harbor. A new asteroid-mining company will unveil itself to the world on Tuesday (Jan. 22) and is expected to present an ambitious plan to exploit the resources of deep space. The new private spaceflight company, called Deep Space Industries, Inc., will reveal its plans at 1 p.m. EST (1800 GMT) Tuesday at the Santa Monica Museum of Flying in California. The new company is the second audacious project aimed at tapping the myriad riches that asteroids harbor. Deep Space seeks to launch "the world's first fleet of commercial asteroid-prospecting spacecraft," according to a press advisory the company sent to reporters. "Deep Space is pursuing an aggressive schedule and plans on prospecting, harvesting and processing asteroids for use in space and to benefit Earth." The company has revealed few other details thus far. It is led by David Gump, who has been involved in a number of commercial spaceflight ventures. For example, Gump headed up the now-defunct LunaCorp, a privately funded mission that sought to land a rover on the moon. Deep Space will have some stiff competition in the asteroid-mining business — a firm called Planetary Resources, which had its own unveiling last April. Planetary Resources has big names and big money backing it up. Its co-founders are Eric Anderson and Peter Diamandis, pioneers of the private spaceflight industry, and it counts among its investors Google execs Larry Page and Eric Schmidt, who are worth $16.7 billion and $6.2 billion, respectively. Further, Planetary Resources' advisers include filmmaker and adventurer James Cameron, former NASA astronaut Tom Jones and MIT planetary scientist Sara Seager. Planetary Resources aims to extract from asteroids precious metals as well as water, which can be split into its constituent hydrogen and oxygen — the chief component of rocket fuel. The company hopes its efforts lead to the establishment of in-space "gas stations," which could allow spaceships to top up their tanks cheaply and efficiently. Just what Deep Space Industries plans to do should be clearer after tomorrow. You can watch the event live here: http://www.spacevidcast.com.